Bryant Smith (Weinberg and Bienen '12) casts his vote Tuesday afternoon in Parkes Hall. Northwestern students and Evanston residents alike came to the on-campus polling center to submit their ballots for the election. The East Coast faced devastating Superstorm Sandy last week. Some families are still experiencing power outages and spending their week in the dark, while others are faced with gasoline shortages. In response, Associated Student Government passed the Sandy resolution to increase awareness of the storm’s aftermath and call students to help relief organizations, such as the American Red Cross. Our sympathies are with our friends, families and all victims of Sandy. On Election Day, Northwestern and Evanston community members exercised their right to vote on campus. The on-campus polling locations were Parkes Hall in the south and Patten Gym in the north. Election judges from the Cook County Clerk’s Office assisted with the voting process. After casting their votes, students even got an “I voted” sticker that they could proudly wear throughout the day. What better incentive for college students uncertain about electoral involvement than stickers? 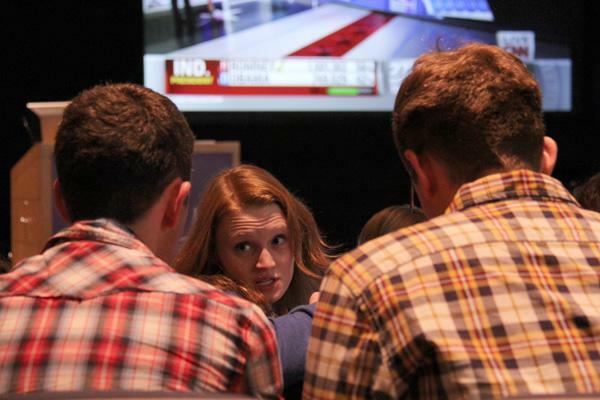 On Tuesday night, Northwestern students and staff gathered at the McCormick Tribune Center, Kellogg School of Management, the Black House and other locations across campus to watch the finale of the presidential race. Each location showed live updates and media coverage of the results. Soon after President Barack Obama’s re-election was announced, students in an already social setting immediately went on social media to air their enthusiasm or disappointment. NU men’s basketball team tipped the season off Wednesday with the only exhibition game against former Big Ten rival University of Chicago. The team has four returning starters, one of them senior forward Drew Crawford, who was second-leading in the Big Ten in terms of scoring average last year. NU fans would love to see their team make the NCAA Tournament this season. Go Cats!